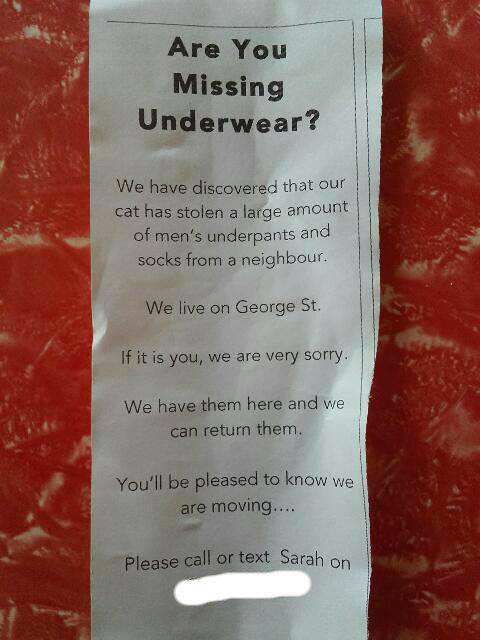 An actual cat burglar has been unashamedly stealing men’s underwear in New Zealand. 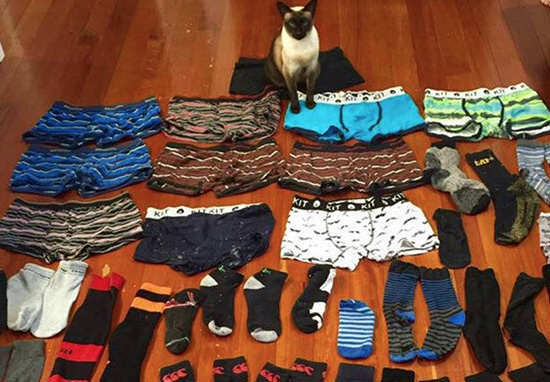 In two months, Brigit, a six-year-old Tonkinese cat, has brought back 11 pairs of boxers and more than 50 socks. The kleptomaniac kitty has caused her owner, Sarah Nathan, so much grief that Nathan has taken to social media to help find the cat’s victims. After having no success in attempting to reach out to neighbours by placing notes in mailboxes, Nathan has taken to Reddit and Facebook to notify owners. Nathan told the BBC that the trouble began when she started discovering ‘odd pieces’ of underwear among her washing. She said: “They didn’t belong to anyone in the house and one day Brigit walked into our lounge carrying a sock like a kitten.” She added that Brigit’s victims were probably a nearby flat ‘full of blokes’. In a previous home, Nathan said the cat wasn’t particular with what she stole, but now she’s developed a specific taste. And like any good thief, Brigit prefers to steal matching socks. “One will be at the front door and one will be at the back door – so she’s obviously gone back to get the matching sock,” Nathan said. This cat burglar gives human burglars a run for their money.